A DAY IN THE BEAUTIFUL PARCO DEL MINCIO A special opportunity to know this beautiful area through its nature and its flavors. A unique opportunity to discover the beauty of Parco del Mincio surrounded by nature: a hike from Borghetto sul Mincio to Pozzolo, along the paved path that runs along the Mincio until the beautiful Pools with restaurant and pizzeria for relax, swim and taste the good food of this territory. After returning an aperitif will wait for you at sunset! The offer includes 2 nights accomodation in one of Borghetto's Mills, bike rental in Borghetto,entrance to the water park and "à la carte" lunch (3 courses). The route by bike is 10 km. (journey time (40/45 minutes). 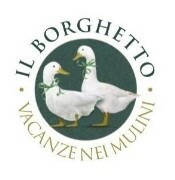 "Il Borghetto - Vacanze nei Mulini" takes its name from the beautiful medieval village where it's located. For our guest we've realized 12 magnificent suites within the XV century mills. Our property is surrounded by the green of the hills, the river Mincio, the castle Scaligero and the Visconteo bridge. The ideal place to spend a relaxing holiday in a small paradise surrounded by the river and its wildlife. This charming village arose over Mincio river in XV century. Once a strategic point to cross the River Mincio, the charm of this small village rises out from the harmonious relationship between nature and history. The medieval atmosphere is underlined by the fortress of the Visconteo Bridge, the bell tower of the church and the wheels of the old mills, once used for the milling of wheat and cereals. It's one of the most visited village among those that have achieved the classification of "One of the most beautiful Villages in Italy". Today the mills have become beautiful suites where you can spend a magical night or a relaxing holiday. We tried to keep intact the charm and enchantment of this amazing place. We are few kilometers far from Lake Garda, in the heart of Pianura Padana with its medieval castles, rivers, nature, wonderful food and wine. Our location is strategic because in a short time you can reach Verona, the city of Romeo and Juliet, or Mantova that you can reach by bicycle and by river as well. It's a perfect place to make a dip in the history of 1400, where time seems to stand still!